The Sri Lanka Association of Australia Awards Alumni (SLAAAA) will present ‘Handa Nihanda’ - Renunciation and Invasion, a stage drama by Dr. Jayalath Manorathna on July 7 as two shows at the Lionel Wendt Theatre. The first show at 2.30 pm will be a dedicated performance for War Heroes under the Ranaviru Sewa Authority and for children in homes managed by the Social Services Department of Sri Lanka. The show will also be open to students at concessionary rates. The second show is open to all at 7 pm. Proceeds of this will be used for funding projects of the Sri Lanka Association of Australia Awards Alumni. The projects of the association focus on facilitating the professional growth and networking of its members with the objective of contributing to the development of Sri Lanka. 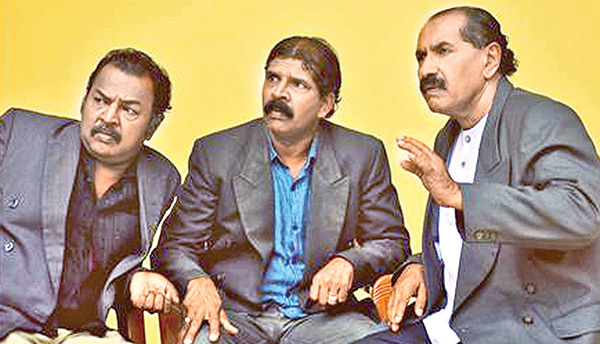 The play evolves through dedication and convictions of five committed artistes in the roles of James Silva played by veteran Jayalath Manoratne, Lawrence Fernando by Laxman Mendis, Marshall Perera by Sanjeewa Dissanayaka, Hector Almeida by Ravindra Yasas, and Martin Appuhamy by Nimal Jayasingha. The drama depicts the lives of artistes, their creations and their social, economic, political and personal problems. It discusses the dual lives that performers lead owing to their presence in popular culture across the eras; one in the public eye and the other with their innermost circle of family and friends. A not-so-subtle theme of the drama is the tug of war between the artistes and recording companies. This is brought to the limelight as the production introduces the humane side of musicians who dedicate their time and energy to please their audience and fans. Basing itself on the life of a musician, the drama unfolds over three eras; initially covering the period from 1900 - 1930, subsequently the 1960s and lastly, the modern era. The play takes the audience on a journey from the gramophone era, to the era of iconic Sri Lankan musicians including Amaradeva, Sunil Shantha and Ananda Samarakoon, and shares with the audience the thrill of their musical experiments and finally introduces the birth of music infused with western influence in its present form. The drama also addresses the necessity to establish a system dedicated to the upkeep of the senior artistes who lack financial stability. The production cleverly plays off true stories as inspirations, where artistes have succumbed to the innate misfortune that arises at old age due to the failure to manage their finances better during the earlier, more successful stages of their life. Sri Lanka Association of Australia Awards Alumni (SLAAAA) as an association of nation’s ‘Thought Leaders’ believes human imagination as the core of innovation in finding solutions for development issues, stated SLAAAA in a release. SLAAAA believes that the worldwide technological advancements clashes with the century old practices of imagination not exclusive of narratives, drama and music. Handa Nihandai unfolds the tale of this clash and evolution having a life of a musician as the subject, SLAAAA added. SLAAAA serves as an umbrella alumni association for all Australia Awards awardees from Sri Lanka. The Australia Awards Scholarships has been an important component of the Australian Government’s official development assistance program to Sri Lanka since the Colombo Plan initiative in the 1950s. The Australia Awards program promotes knowledge, education links and enduring ties between Australia, its neighbours and the global community. Since its inception, over 600 candidates from both the public and private sectors have studied in Australia under the program and are part of the SLAAAA. Many of the members hold pivotal leadership positions in national institutions including, but not limited to, the health, agriculture, education and finance ministries, as well as private sector organisations. The association seeks to strengthen the bonds between the alumni both locally as well as internationally and to create opportunities for intellectual and cultural exchange between Sri Lanka and Australia. It is a platform that provides members with opportunities for professional development whilst building networks to collectively contribute towards the development of Sri Lanka, SLAAAA stated.